Dr. Fred Lewis was a masterful recruiter, who turned around the Syracuse basketball team in an amazing short time, in two years transforming a team that was 2-22 into a NIT Tournament team, and in four years to the NCAA. He brought in the amazing Dave Bing, and West Point transfer Chuck Richards, along with several top flight players from the New York metropolitan area. Lewis had coached Southern Mississippi prior to coming to the Hill, compiling an 89-38 record in five seasons. He started coaching in 1950 for Amityville High School (NY), where he went 63-40 over four seasons. He coached one season at the University of Hawaii, going 21-2. He was a gifted basketball player himself, having played for the championship Long Island University (LIU) teams. The war interrupted his career, and he continued afterwards at Eastern Kentucky, where he earned small school All-American status. He scored 1,588 points in his collegiate career for the two schools (1,021 at Eastern Kentucky and 567 at Long Island). He played professionally in the NBL where he earned Rookie of the Year honors in 1947 with Sheboygan Redskins. Lewis loved the fast pace game, with the Orangemen learning to run the ball, and then run it some more. The 1965-1966 team led the nation in scoring, and came very close to becoming the first school ever to average 100+ points a game. Lewis was a coach that was very demanding on his players. He changed his lineups frequently playing hunches. A common ploy for Lewis was to start his reserves, and then bring in his starting lineup to play against his opponent's reserves. 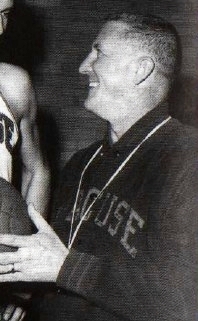 Lewis was constantly in battle with school administrators, in attempts to elevate the basketball program at a school where football was the main game at the time. When his six year contract expired, Lewis resigned to take the position of athletic director at Cal-Sacramento State, citing "it's not worth all the aggravation" to remain at SU. He coached one season for Sacramento State, in 1984-1985, going 7-28. His NCAA coaching record was 208-125. In his six seasons at Syracuse, he had turned the program around, earning two NCAA and one NIT berths. Lewis passed away in 1994.